Back cover blurb: There’s a stranger in your home… When her stepmother dies unexpectedly, Caro returns to her childhood home in Derbyshire. She hadn’t seen Elizabeth in years, but the remote farmhouse offers refuge from a bad relationship, and a chance to start again. But going through Elizabeth’s belongings unearths memories Caro would rather stay buried. In particular, the story her stepmother would tell her, about two little girls and the terrible thing they do. As heavy snow traps Caro in the village, where her neighbours stare and whisper, Caro is forced to question why Elizabeth hated her so much, and what she was hiding. But does she really want to uncover the truth? 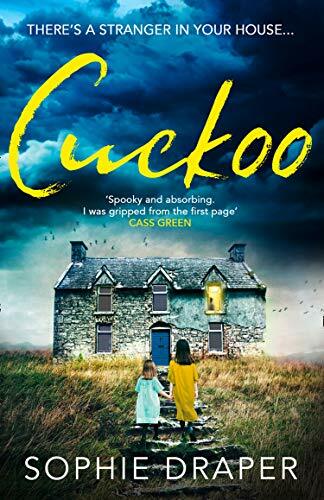 Cuckoo was originally sent to me as an intriguing email from the publisher with the title 'Can You Keep A Secret', along with an invitation to download the mystery novel from Netgalley. I'm a sucker for a bit of mystery and intrigue, so immediately jumped at the invitation. Cuckoo is the perfect novel for Halloween, creepy, atmospheric and tense. When Caroline (Caro) returns to her family home after the death of her Step Mother, she is reluctant at first to start going through her things. Having moved out of the family home to attend University, Caro hasn't returned since. The house itself has some bad memories for Caro, her childhood and teenage years blighted by her Step Mother Elizabeth's attitude towards her. She has always seemingly hated Caro ever since she was a little girl, and Caro could never understand why. Elizabeth also drove Caro's elder Sister, Stefanie away with her behaviour, and Caro's relationship with her sister has never quite been the same. Caro sees Elizabeth's death as an opportunity to rebuild her relationship with Stefanie. As she begins to clear the house she grew up in, Caro begins to recover possessions and memories that she realises should remain hidden forever. To bring these things out in the open now will only do damage, but perhaps it is already too late for that. I think having no previous knowledge of the book's title, back cover blurb or author really helped my enjoyment of this novel, as it added an extra element of mystery, all in all a solid very enjoyable read. Cuckoo is available from 29 November. Thank You to the publishers who invited me to read this novel via netgalley in exchange for an honest review.